Another 2-for-1 deal, oops! My excuse for missing last week is that I drove up to Brisbane and back on Sunday for Dave's final tattoo session. I'll do a post on his tattoo soon, once it's fully healed. Week 7's topic: Share a photo of your reading space/nook/area (if not possible then describe it instead). What do you love about it? How did it come to be your reading space? Is it missing anything? While I don't have a specific reading nook (one day...) I do have the world's comfiest couch. This couch is huge and soft-but-firm, deep enough and long enough to sleep on but with plenty of cushions to pile up to get comfortable, with plenty of room for both of us, one of the cats (they tend not to socialise together) and Phoebe (if she's lucky). It's overlooked by some of our bookshelves (yes, there's plenty more), has the laptop within easy reach if I need to look something up (which I do frequently while I read), and has an excellent view of the TV if I want to have the rugby or cricket on in the background. The only thing I'm missing is a decent reading lamp - the lamp in the picture 1) has a blown bulb, and 2) points up, not down. Week 8's topic: Share some of the other book blogs you love to follow, who have inspired you, or who have become your online besties. Apart from Bookish Ardour, I only follow one other "dedicated" book blog: The Well Read Kitty - a fellow Kiwi. I have just added BookieMonster (another Kiwi) after she was linked from The Well Read Kitty. Some other bloggers I follow, like Miss RBit, also do book reviews and talk about reading and books. 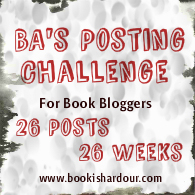 As I read more book bloggers, I'll find more that interest me - blog reading has a bit of a snowball effect. I've finally found a more-than-adequate replacement for Google Reader - Feedly. If you're looking for an RSS reader to replace Google Reader, I highly recommend this one. I'll try to get back on track with a post a week, I promise!